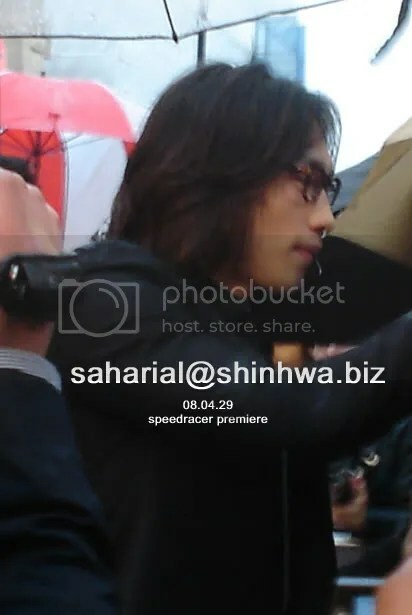 [Celeb] Bi at Speedracer Premiere! I got to Leicester Square at about 11am because i wanted to make sure I got a good spot. I met a lady who does this for internet TV and i ended up with a spot right opposite of the doors they go into for the première. It was really cold and windy and the rain that was predicted happened on queue. Then, finally he walked over and for a moment we thought he was just going to pose for pics on the carpet and then go in, but we were yelling for him (still) so he did and he was like 5 inches in front of me (this number varies when I get too excited). He kept saying sorry a lot, cos I think he knew he couldn’t sign for everyone, and shook hands with people. He pronounces sorry very well! My pen got knocked out my hand by an excited girl behind me and one of his entourage picked it up and handed it back – they seemed really cool I handed him a CD to autograph and cos of the rain it was wet in seconds, so he wiped it with his already wet sleeve and signed it for me, but the rain pretty much washed it off in seconds – there is a faint mark though so I am treating it very precious. He was wearing a dark suit and black framed glasses and his hair was not as bad as some of those pics seemed to make it seem at times. He seemed happy and relaxed, very calm and pleased with the attention. He is a really nice height and quite slender, especially in the face, but he seemed healthy. He then went further along the line and to the far corner to make sure that everyone got seen as much as possible before going for some interviews on the red carpet with T4 and then with an internet TV channel. 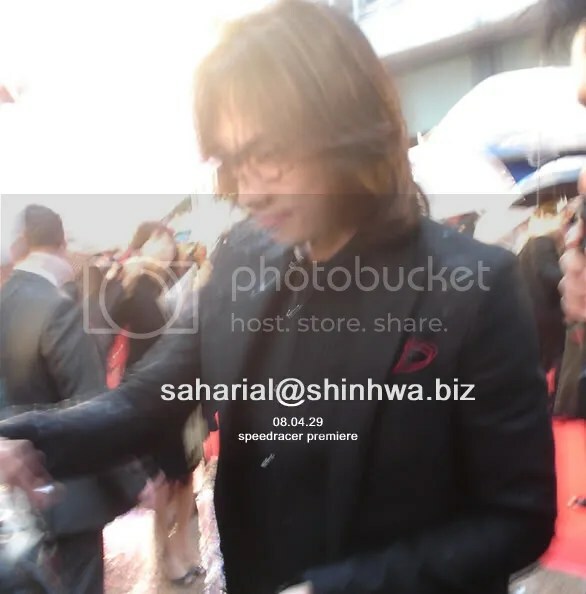 He then went back to the fans on the other side and signed some more before going into the première. He was definitely much more interactive with the fans compared the the western stars and his effort was so much more obvious than anyone else’s. He stayed out on the carpet and with fans the longest out of everyone. I hadn’t eaten since breakfast either or drank much so I left after he had gone in. I would like to blame this lack of food and drink as being the reason my legs went wobbly after he had gone, but the fact I didn’t even see John Goodman standing in front of me .. well.. hehe I guess I’ll have to admit it was Bi that did that!! Lucky, lucky Kay! 5 inches! Too bad the autograph got washed off. Anyway the experience is still great isn’t it? Being there and seeing is more important! I wanna cut his hair…. And wow Bi with long hair is weird o_o i almost didn’t recognize it was him!